Exploring the frontiers of fire safety at third BRE Fire Research Conference. BRE's 2017 Fire Research Conference brings together its most diverse programme of papers yet on contemporary fire engineering challenges, ranging from space travel and airports, to photovoltaic energy and product regulation in the wake of BREXIT. Featuring guest speakers alongside BRE fire engineers and investigators, other themes include multi-sensor detectors and fire alarms, innovations in fire suppression, deficiencies in passive fire protection, and data and trends emerging from the investigation of real fires. BRE carries out a wide range of research projects, working with government and major stakeholders on pressing areas for investigation and improvement in fire protection and fire risk management. 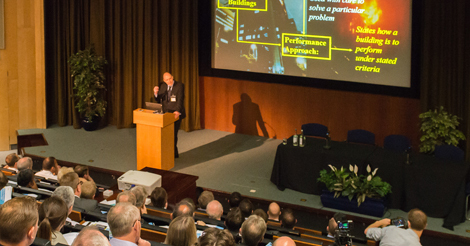 The annual conference has quickly established itself as an important forum for disseminating this vital information, reflecting BRE's standing in the field of fire behaviour research and fire performance testing. Delegates will have the opportunity to update their technical knowledge, learn directly from the experts about advances in fire safety and standards development, and network with professionals from all areas of the fire sector.